New Yorkers overwhelmingly want a second chance at welcoming global e-commerce giant Amazon.com back to New York City, according to a new Quinnipiac poll. Amazon had chosen Long Island City, Queens as its preferred location to build a second headquarters, known as “H2Q.” In exchange for $3 billion in tax incentives, the mega-corporation would have delivered an estimated $27 billion in tax revenue over 25 years and at least 25,000 jobs. That deal fell apart, however, when anti-business activists targeted the company and its founder, Jeff Bezos, who is the world’s richest man. By a margin of 64-28, Quinnipiac found that New York voters want Democratic Gov. Andrew Cuomo and other leaders to convince Amazon to reconsider. Voters supported offering tax breaks to encourage businesses to locate to the state, 62-29. In both cases, there was strong support across every listed polling delineation, including political party, gender, education, age, race, and regional group. “In hindsight, New Yorkers think those hotly debated incentives offered to Amazon were worth it in the end,” said Mary Snow, polling analyst for Quinnipiac University. “Almost two-thirds of New Yorkers want elected officials to try and woo Amazon to reconsider its decision not to build a campus in New York,” said Snow. The poll was conducted from March 13 to 18, and surveyed 1,216 New York State voters. It has a margin of error of 3.8 percentage points. As an aside, Quinnipiac found that voters approve of Cuomo’s job performance, 50-41, which is the first time he reached 50 percent since May 2018. Only 46 percent of voters approved of Sen. Kirsten Gillibrand, (D-N.Y.), who is currently running for president. 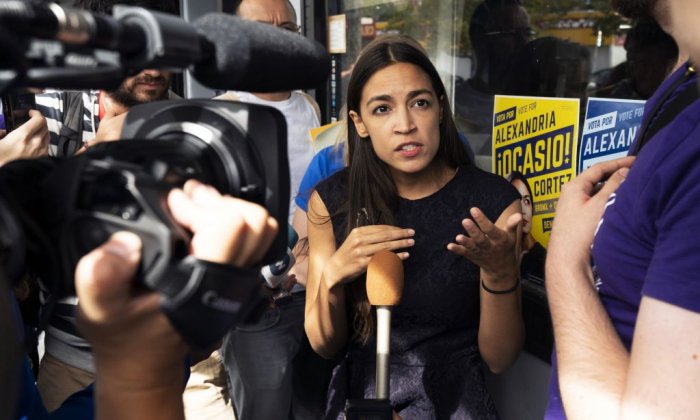 On Tuesday, March 19, a Siena College poll found that New Yorkers blame Rep. Alexandria Ocasio-Cortez, (D-NY), more than anyone else for the Amazon debacle. Thirty-eight percent said Ocasio–Cortez, a self-avowed socialist, was the biggest “villain” in the widely-viewed missed opportunity, although 12 percent said the outspoken freshman congresswoman was a hero. For months, Ocasio-Cortez helped drum-up local activist resistance to Amazon, in addition to leveraging her immense social media following. Ocasio-Cortez’s district includes parts of Queens, and she regularly denounced the company’s hiring practices, wages, and lack of unionization. She took particular issue with the decision to offer $3 billion in state and city subsidies, which she believed should have gone to teachers and the local subway system—although the money mostly only existed as a reduction in Amazon’s long-term tax liability. “After much thought and deliberation, we’ve decided not to move forward with our plans to build a headquarters for Amazon in Long Island City, Queens,” an Amazon spokesperson said in a statement on Feb. 14. But New Yorkers have a starkly different view. “At least 63 percent of Democrats, Republicans and independents, upstaters and downstaters, men and women, young and old, black and white New Yorkers agree: Amazon pulling out of Queens was bad for New York. Even 56 percent of self-described liberals think it was bad for New York,” said Siena College pollster Steven Greenberg in a statement. “While some may have celebrated Amazon’s announcement to pull the plug, the vast majority of New Yorkers of every stripe thought it was bad for the Empire State,” Greenberg said. The Siena College Poll was conducted from March 10 to 14, by telephone to 700 New York State registered voters. It has an overall margin of error of 4.2 percentage points. The Amazon fallout also comes at a time when New York is facing tough financial challenges. Gov. Cuomo announced a projected $2.3 billion budget shortfall on Feb. 4, or less than two weeks prior to Amazon’s retreat. The shortfall was even steeper last year, but state leaders were able to balance the budget by reigning in spending. In what looks to be the beginning of a long-term revenue bind, Cuomo blamed congressional Republicans and President Donald Trump for a provision in the Tax Cuts and Jobs Act of 2017, that caps state and local tax (SALT) deductions from federal income tax liabilities at $10,000. Previously, there was no cap, and New York state’s average SALT deduction was $22,000. CNBC analyst Andrew Ross Sorkin expressed alarm at New York City’s long-term business prospects, and the rise of socialist sympathies via Ocasio-Cortez, Mayor Bill de Blasio and others. “If you’re a major company in America, thinking of wanting to do business in New York City … I’m not so sure this isn’t as an attractive place as it was yesterday,” Sorkin said.